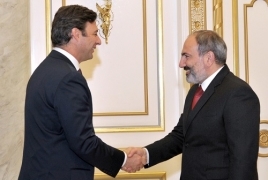 PanARMENIAN.Net - Prime Minister Nikol Pashinyan on Tuesday, April 9 hosted Martin Eurnekian, Executive Director of Corporación América, who was accompanied by Eurnekian Company Director Jorge Del Agila and Director General of Armenia International Airport Marcelo Wende. During the meeting, investment programs implemented by the company in Armenia and the prospects for their expansion were discussed. Reference was made to the development of Yerevan’s Zvartnots airport, Shirak airport in Gyumri, the planned infrastructure improvements, HayPost CJSC’s activities, and the program of reconstruction of the former Republic Square-located building of the Ministry of Foreign Affairs of the Republic of Armenia. Ideas were exchanged on the development of the aviation market and promotion of competition. The parties expressed satisfaction with the atmosphere of cooperation between the Government of the Republic of Armenia and Corporación América. Both sides reaffirmed their readiness to build on the existing ties of interaction. The Prime Minister attached importance to the programs implemented by the company in Armenia, which promote the business environment in our country. An arrangement was reached to follow up the discussion between the Office of the Prime Minister, stakeholder agencies and company representatives.